This would definitely help you too. This post is aimed to summarize the key features of the Blogger template. Its in fact everything that you see on a webpage, (every content of a website is part of body). Its the mother section you may say. Every thing lays in it. The two tags are body tags which contain every thing that you can see on a website. Its another block within body which contains every other object that you can control. 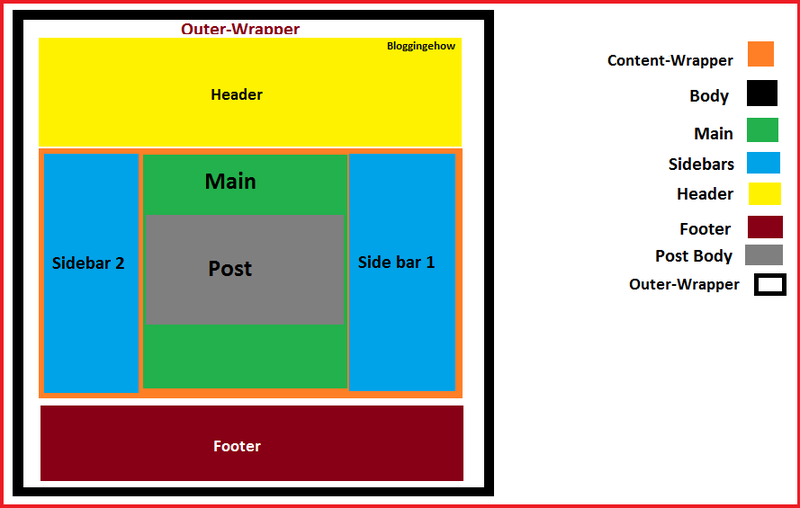 The main objects within outer-wrapper block are Header, Content, Footer areas. Notice how the 'Outer-Wrapper' appears after the <body> tag in your blog's HTML Editor, where all you blog's template code lays. Header, as the name suggest is the section that contains all your blog's head content like header banner, adsense code maybe, description, navigation bar etc. This section of your blog is pretty important as it contains the main body section of your blog (not to confuse with <body> discussed before) that has all your text content like what you are reading now. The content section also has footer and sidebars. 'rsidebar' has 'r' as to denote right sidebar. It can be anything like this. Notice i have a single sidebar on the right side so it appears likewise in my HTML editor. It can be simply ( <div id='sidebar-wrapper'>) too. 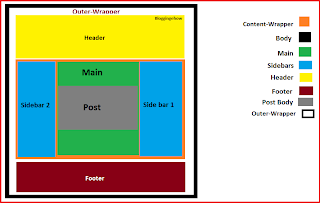 The footer area is the one which contains your credits like All rights reserved, copyright Bloggingehow etc.